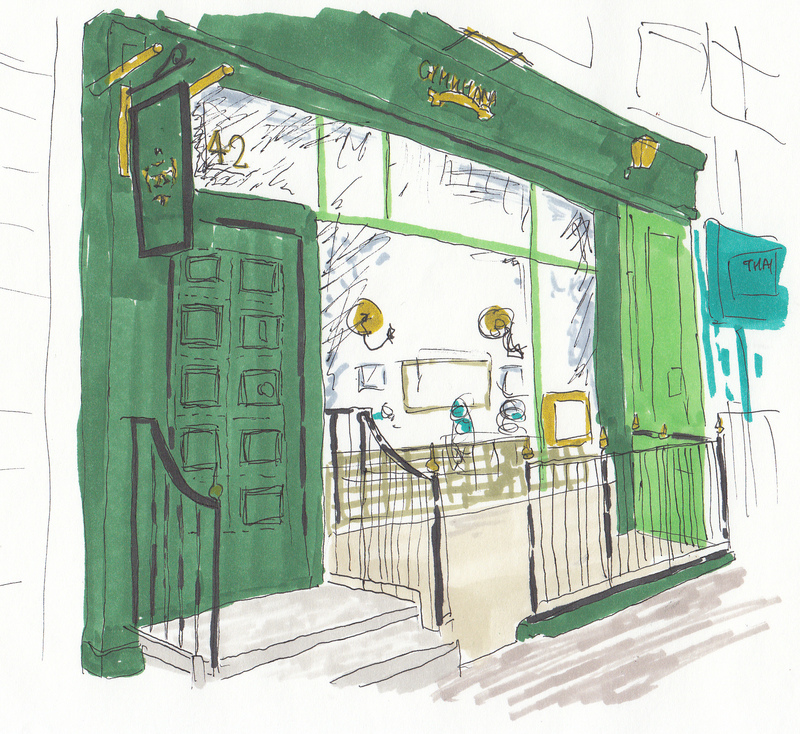 Gymkhana opened in September 2013 and is the sister restaurant of Michelin-starred Trishna in Marylebone. It has received rave reviews from all the major critics (scoring 10 out of 10 from Giles Coren in the Times) and was recently voted as the best restaurant in the UK in the national restaurant awards. Gymkhana is a British colonial term for a sports club and the decor (leather, dark wood and marble) emulates an ex-pat Gentleman’s club. Chef patron Karem Sethi is a North London boy who started his working life as a caterer, and following a stint in the kitchen at Zuma, opened Trishna at the tender age of 23. He has since set up the Sethi group which provides financial backing for a number of restaurants in London and abroad, including Bubbledogs. The menu at Gymkhana is relatively short and relies on British ingredients, including an interesting range of game (roe deer, guinea fowl, pigeon, quail, muntjac). In addition to a selection of fairly typical Indian starters, they offer “nashta” which are tapas style sharing dishes, and a range of meat, seafood and vegetable tikkas. 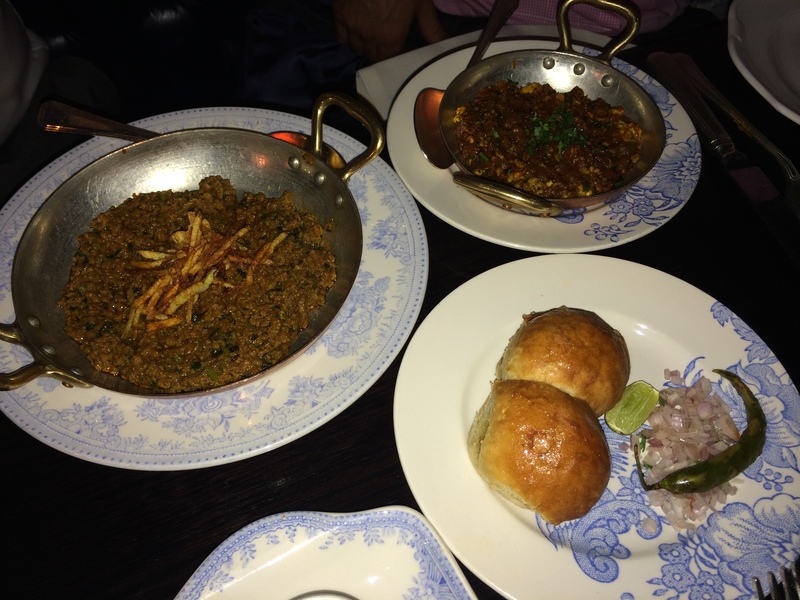 We started with the now infamous kid goat methi keema, with bheja (brain) on the side (£14) – this was the highlight of the meal for me, the minced goat meat was full of flavour, almost gamey but with just the right fat content so that it was not dry. The pao buns served alongside were slightly sweet and similar to brioche, they were a perfect way to mop up the fenugreek stock of the curry. And finally, the brain (top right in the picture above) was glorious – rich, gelatinous, melt in the mouth……certainly my culinary highlight of 2014. 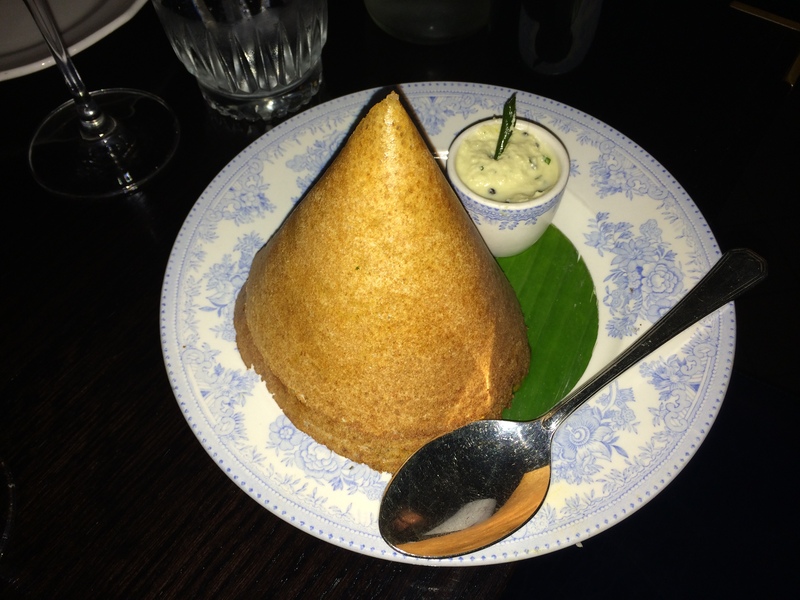 The rather diminutive duck dosa (£8.50) was served in a pancake tipi, the sheltering meat was dense, fibrous and only lightly spiced. Our final starter, a quail kebab with green chilli chutney was rather underwhelming – the meat was characterless and the chutney, whilst light and refreshing, needed stronger spicing to tart up the lackluster meat. 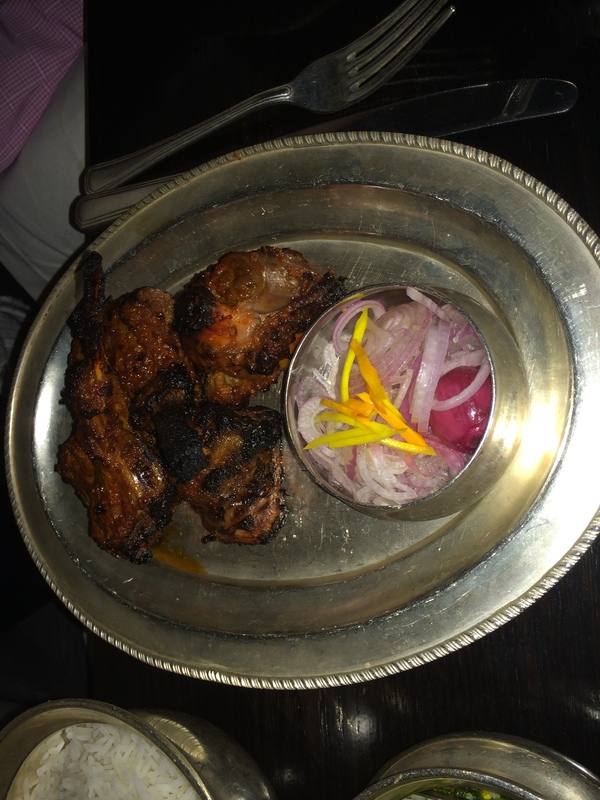 Tandoori Guinea Fowl (£20) utilised both leg and breast – the meat was superbly tender and had the perfect level of tandoori smokiness; the charred skin added texture and depth of flavour. The menu advertised a “green mango chat” and I was hoping for a light mango salad, rather than some splinters of mango atop a whole chopped red onion (see above). The quality of the meat in the Nalli Lamb Kebab (£25) was again very good and the light spicing allowed the deep flavour of lamb to come through. We finished with suckling pig vindhaloo (£18) – the waitress had warned us that this was very spicy but the resulting dish was, by modern British standards, at most medium spiced. The curry was delicate enough, the sweet subtleness of the suckling pig was lost in the spicing. And a final note on the pricing – I think that the main courses are a tad overpriced, especially given portion sizes are small, but I am happy to pay a premium for cooking of this quality. I like your food photos but I really love your sketches. They personalise your reviews and make them just that bit different/special. Nice!